Join the discussion on our forums! Come discuss Mistress of Mixtures over in our dedicated Mistress of Mixtures discussion topic. Deathrattle: Restore 4 Health to each hero. Her favorite mixture is cola and lime. For me it's still the most solid/well rounded 1 drop for any control deck. Quality! One of the best designed cards, not OP or weak, just fair and also helps control decks ! This card should read: Top deck this card in arena late game when it's a close and lose. I love this card. Great early game, and it's also anti-aggro. It's a dream come true. And the best part, no side effects! At first i thought the attack line was "lick my stick"
If your character dies at the same time as this minion (Hellfire, etc) - you will not be healed. death animation is like a bad actress who throws potions at our faces before dying horribly in a funny way. I love this card's design, if only more cheap cards can be perfect for anti-aggro, without being an aggro tool itself like Muster for Battle, great job on this one Blizzard! 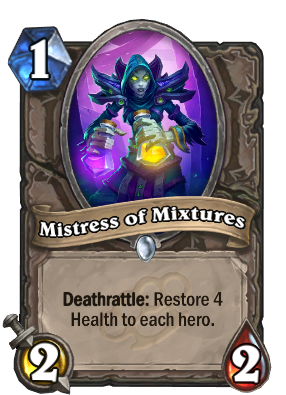 Can't see this being anything but good, I think the self heal is more relevant than the 2/2, the difference between this and funnel cakes being at 1 mana its something to do early game and easier to weave in late game. Tbf no cost on stats for the effect either. Welcome back, Zombie Chow ! Now you will heal me too? Nicely balanced card! Yay! Anti-aggro 1 drop! ... Too bad aggro gets twice the good stuff, but it's a good step, at least.